We are always looking for new ways to improve how our customers interact with us, and with over 74% of customer interactions happening digitally, it is more important than ever to develop our offer in these channels. Conversocial (@conversocial), the leading social customer engagement platform, announced today the launch of eir’s integration with Facebook Messenger. The new partnership will enable Ireland’s largest telecommunications provider to directly and discreetly engage with its nearly 2 million subscribers. Facebook Messenger for Business joins Twitter as an additional way that customers can reach eir and is the latest addition to its existing social customer service strategy. With over 900 million active users, Facebook Messenger is fast becoming the engagement channel of choice for businesses and consumers around the world. Conversocial is the platform of choice for leading global telecommunications providers including Sprint, Virgin Mobile and more. By enabling telecom companies to engage their customers in real-time over FB Messenger, Twitter, Instagram, Google+ and more, service providers are able to quickly respond to their customers’ needs and queries easily and effectively. Today’s social, mobile consumers are empowered by their devices and expect a personal and tailored experience from their providers. Intimate, real-time, and convenient customer engagement is what Conversocial consistently delivers to its clients, enabling them to drive humanity at scale. 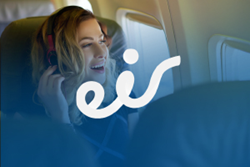 The service is now available to all eir customers. Conversocial (@conversocial / http://www.conversocial.com) is the leading social customer service platform enabling hundreds of global brands including AIB, Aer Lingus, Hyatt, Hertz, Tesco, Alaska Airlines and more to engage directly with the new socially empowered customer to drive real and lasting relationships. Customer engagement is a critical differentiating factor for customers and Conversocial’s platform allows brands to provide the most human, scalable and impactful engagement by maximizing social channels. Conversocial is the leading innovator in the sector, having pioneered solutions on FB Messenger, Twitter, YouTube, Instagram and more through their close partnerships with leading social giants like Facebook, Google and Twitter. Conversocial is a Twitter Certified Partner, Official Instagram Partner and a Facebook Preferred Developer. For more information, visit @conversocial) / http://www.conversocial.com. eir is the principal provider of fixed-line and mobile telecommunications services in Ireland with approximately 2 million customers. The company has the most extensive fixed and mobile network in Ireland and provides a comprehensive range of advanced voice, data, broadband, TV and ICT services to the residential, small business, enterprise and public sector markets. The wholesale division, Open eir, is the largest wholesale provider in Ireland with more than 40 operators using our network. In 2013, eir was the first operator to launch 4G services in Ireland.